Having served his motor vehicle apprenticeship at Victor Morralls in Evesham Ernie Dudley moved to Evesham’s Ford dealer Coulters. 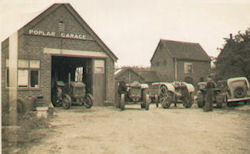 In 1938 he decided to go it alone and using land adjacent to his parents house he set up a repair workshop repairing agricultural and motor vehicles and soon added petrol sales. (As there was no mains electricity in the area until the late 1950’s important sidelines included recharging accumulator batteries and selling paraffin for heating). As a number of local residents were not car owners Ernie was often persuaded to give people lifts in his car (and on at least one occasion lent his car to someone in order that they could take their driving test). However it was not until 1954 that the company had its first proper involvement in passenger transport. At this time Mr. Hugh Stanley from Rous Lench had the contract from the Worcestershire County Council to transport children from Abbotts Morton and Radford to Rous Lench School. 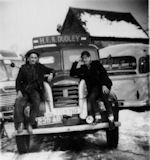 On his retirement the vehicle, an orange Cheverolet school bus was purchased by Ernie, and Dudley’s had their first school contract. By 1956 a Bedford Dormobile had been purchased, and the contract for transporting pupils to Prince Henry’s Grammar School Evesham from Abberton and Bishampton was taken over from Mr. Hutchins of Bishampton. In 1960 the first PSV specification vehicle was purchased. 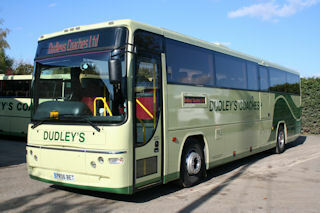 Supplied new by Wakefields of Worcester the 14 seater Karrier with Reading body (Reg. No.810 AUY) was painted in black and silver (the only Dudley’s coach ever to receive this livery). During these early years many different makes were added to the fleet including chassis from Sentinel, Commer, Bedford and of course Ford. With bodies by Plaxton, Duple, Burlingham, Churchill and a rare 24 seat King & Barnes body. 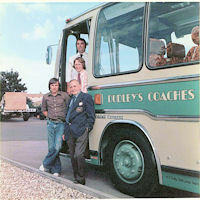 During the 60’s the coach fleet colours changed from Red and cream to Lilac and Cream. In 1968 Ernie’s son Christopher left school and joined the company. In 1973 the fleet colours changed to Blue and White. 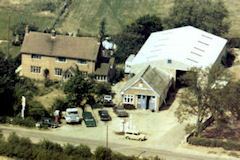 The early 1970’s also saw changes to the buildings an old Nissan hut which had been used as workshop was demolished and a new workshop built in its place. Not having his father’s natural ability in mechanics Chris’s interest lay with the coach operation. In 1976 the companies first new large coach was purchased, he may not have had his father’s mechanical ability but Chris did share his affection for Fords and in September a 53 seater Ford R1114 with Plaxton Supreme body was collected from Scarborough. This Heralded a change in colour scheme and the current company colours of green and cream were adopted. A further step away from the original business occurred in 1978 when the narrowing margin in petrol sales persuaded the company to discontinue retail sales of petrol. It was during this period that vehicle repairs for outside customers started to dwindle and the workshop was almost wholly committed to maintaining Dudley’s fleet of coaches. In 1986 the coach fleet and business of Royal Motorways of Redditch was purchased when its then owner Mr. Sydney Strain decided to concentrate on his forecourt sales at his Studley Road site. The amalgamation of the two fleets led to changes at the Radford premises a large parking area was made at the rear of the workshop and in 1988 new offices were built on the site, replacing the original workshop which had now become redundant. At the dawn of the new century the fleet livery was changed, still retaining the Green/Cream theme ‘wavy lines’ were introduced along the sides of the vehicles. At this time the Royal Motorways name was revived with a distinctive Union Jack livery featured on one vehicle. On 1st May 2002 the business of Kingfisher Travel from Redditch was acquired along with its 4 vehicles and 3 drivers. The fleet consisted of a Bedford Duple 200, a Daf Duple 200, both of which were sold immediately. The remaining 2 vehicles were a Bedford Plaxton which had been converted to Volvo power and a 1984 Leyland Tiger with Plaxton Paramount body both of which were part exchanged within the next two years. July 2004 Boomerang Bus Company (formally known as Warners Fairfax) ceased operating and we took over the operation of Pershore Plum Line, which we continued until June 2005. At this time we also ceased operating two long running services. Firstly our school coach service, which ran from the Evesham area to The Worcester Private schools, which had been operating for over 20 years. The second service was the Redditch to Longbridge route, which we took over from Royal Motorways. The exact original start date of this service is unknown but it had been running for over 50 years. In January 2007 the number of children travelling on our contract to St Augustines High School increased so we converted L238 MUX into a 70 seater school bus. This proved to be a popular size of coach and the conversion of another vehicle, L908 NWW, followed. In August 2008, a requirement from Worcestershire county council for a nearly new 70 seater for a specific school run led to the purchase of PR06 BET, a Volvo B7R with Plaxton Profile body, factory built as a 70 seater with a side mounted wheelchair lift. This brought the number of 70 seat vehicles in the fleet up to 3. 2008 also saw the purchase of an 18 seater Toyoto Optimo, a 49 seater Volvo B12M with Plaxton Panther body and a 51 seater Volvo B12m with Vanhool T9 body. 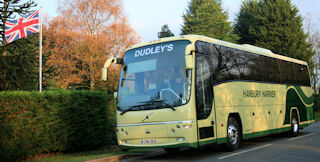 2010 saw a move forward with the purchase of a brand new Volvo 9700 Prestige Plus, the first brand new coach since the 1980's. A full executive vehicle with chassis and body built by Volvo. This new vehicle also saw a subtle change to the fleet colours with the introduction of metallic greens to replace the previous base greens. In addition to this a 2 year old Volvo B7R with Sunsundegui Sideral body was purchased, with 43 seats it sits in the middle of the size range. 2011 saw a number of changes in the fleet, with 4 of the older vehicles being sold. 2 of the 70 seat vehicles were sold, which led to the conversion of S753 CKO to a 70 seater in order to keep 2 vehicles with 70 seats. With changes to London's low emission zone, it was decided to invest in another brand new vehicle, a Volvo B9R with Plaxton Panther body. This one a standard 53 seat vehicle to fulfill the need to convey a larger number of passengers in comfort and add to the 2 existing vehicles complying with the new emission requirements. 2012 saw the fleet grow once again with the addition of another brand new Plaxton Panther bodied Volvo B9R. Again with 53 seats it is the sister to the Panther purchased in November 2011. This was originally put into a specific livery for a contract in 2012 and now has a modern take on the Royal Motorway's livery. 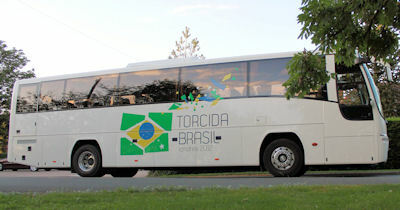 In addition a 22 seat Toyota Caetano Optimo was purchased to replace the 18 seater which has proved very popular. This 57 plate Optimo has the advantage of being slightly bigger and is 2012 LEZ compliant for going into London. This brings the fleet size up to 19 at present, but with 2 up for sale. The decision was made to reduce some services due to low demand. This reduction in services allowed the fleet to reduce by 5 vehicles, reducing the average age of the fleet and allowing us to concentrate on the coach side of the business. The fleet once again has grown by the addition of 2 more vehicles. A 29 seat Mercedes to fill a gap between the 22 seat minibus and the 43 seat midi coach and at the upper end of the seating capacities, a 71 seat Plaxton was purchased.